Signature may know how to make very fine-looking adjustable-height desk furniture. Now that they've wisely gotten out of the treadmill base business and have chosen to OEM the LifeSpan treadmill bases instead we have no complaints there. LifeSpan makes the best OEM walking treadmill bases around. However the company's reputation is muddled by the use of all sorts of unusual dealer and marketing fronts, as well as patently false marketing claims. If you’re looking for high-end, traditionally elegant furniture as your highest priority then Signature has a broad range of desk styles and beautiful finishes to choose from. Signature no longer offers their own treadmill bases (which were poorly rated) but now bundle in the venerable LifeSpan TR1200 base (WorkWhileWalking's Editor's Pick for light-to-medium duty applications) as most other integrated treadmill desk vendors do. We used to recommend avoiding Signature's Pace XR100, XR200 and XR300 treadmill bases but since they have wisely chosen to discontinue these models and substituted them with LifeSpan's treadmill bases we have no concerns there. However, the company’s reputation and internet marketing practices remain very shady. No independent user reviews of their products are available on the Internet; their own reviews are curated or invented. Even with infinitesimally low independent internet traffic scores they have ranked themselves as "#1 in the treadmill desk industry for the past four years" (cough, gasp, sputter). They warranty policy seems sketchy and doesn't cover labor at all. Aside from some unique shapes—and in the case of the Excecutive model, a very corporate aesthetic—the woefully expensive Signature desks offer very little by way of features and capabilities. Despite costing up to three times as much as other, more reasonably-priced mid-tier treadmill desks, Signature's desks don't offer anything to justify the high price. We're extra wary about the lack of published lifting capacity, and would warn desk seekers from betting on what could prove an unreliable product. We talk a lot about the “DNA” of various companies that have entered the treadmill desk arena, most falling in either the fitness equipment manufacturer or the office furniture manufacturer category. Signature definitely falls into the latter category, having been making custom desks since 2009. They are one of a several desk manufacturers that have decided to exploit the treadmill desk industry by bundling some of their products with a treadmill base. If you're looking for something truly custom-grained they may be a very good vendor for it - that's beyond the scope of this product review - but as for off-the-shelf product their desks are generally overpriced compared to the competition. All their desk products are handcrafted in a family-operated plant based in Fort Wayne, Indiana. Signature offers three different desk models and (on some of their websites) a choice between the three LifeSpan treadmill bases (the TR800, TR1200 and TR5000); on the company's main website they only offer the TR1200, which is great unless you really need a TR5000 for a heavy-duty application like a shared departmental treadmill desk workstation (or better yet, a more modern unit like the iMovR ThermoTread GT). 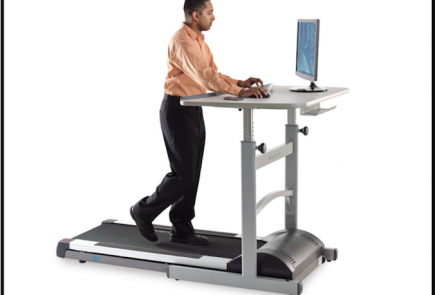 The “Executive 2.0” model is probably the most traditionally elegant treadmill desk you’ll find in the market. You can choose both the desktop color and the leg/front panel color, be it Kensington Maple, Figured Mahogany, Rio, Natural Pear, Banister Oak, Aloe, Amber Cherry, Biltmore Cherry or Madagascar. The company claims its laminated finishes are scratch-proof. The desktop comes in three different sizes: the Standard at a rectangular 75” x 30”, the Radial at a 75” x 30” rectangular dimension but with a curved front edge, or the Grande at a rectangular 75” x 36” dimension. See the Executive 2.0 Dimensional Chart to get a better idea of how these options stack up. Back when Signature offered its own treadmills the key advantage of the Executive 2.0 desk model was the fact that their control consoles could fit perfectly into one of the built-in desk drawers. Since switching to the LifeSpan treadmill bases required placing the LifeSpan control console directly on the desktop (it's too thick to fit in the drawer) this key feature has been lost and so the Executive 2.0 model has become a very pricey piece of furniture with no particular advantage over many other electric height-adjustable desk options available in the market for a lot less money. 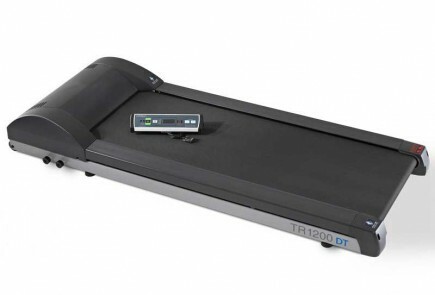 Bundled with the TR1200 treadmill base the Executive 2.0 sells for $3,999. The “Glide 1000” desk is downscale from the Executive 2.0 but also a very attractive design. It has a slightly greater height range from 30” to 57”, and comes in one standard desktop size of a rectangular 75” x 30”. The desktop color options are Black, Rio, Natural, Oak, Cherry and Mahogany, and they all come with two grommet holes for cable management. Unlike the Executive 2.0 the Glide 1000 leg/front panel selection is a Henry Fordish “any color you’d like as long as it’s black.” The lift mechanism is heavy duty but very quiet, and has a range from 30” to 54” in desk height. The Glide 1000, like the Executive 2.0, comes with two drawers. Even though the company's website still shows pictures of their desks with their discontinued line of treadmill bases where the control console used to fit in one of these two drawers, with the new LifeSpan OEMed treadmill bases this feature is no longer relevant. The downside to having two drawers is that if you wanted to install an ergonomic keyboard tray under your desktop you'd be out of luck. At a price of $2,999 including the LifeSpan TR1200 treadmill base the Glide 1000, like it's sister product the Executive 2.0, becomes a very pricey option for a powered height-adjustable desk compared to equivalent desks in the market, with no particular competitive advantages. 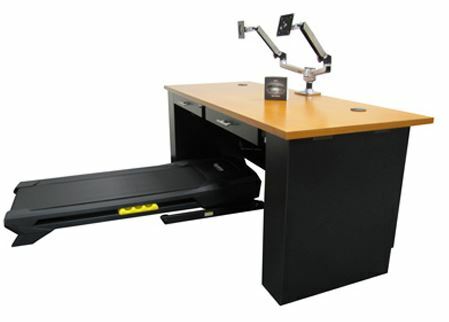 The third style of Signature desk is the “DZ9500.” This is a narrower adjustable-height desk that sits directly over the treadmill, not able to accommodate a chair on the side. This unit is comparable to the Steelcase Walkstation or the LifeSpan DT7. It has a height range of 25” to 52” and comes in six different flavors of desktop shapes and sizes – from 50” to 63” in width and 28” to 32” in depth. The surfaces on this model have been revised from the original unit. The desktop is now made from handcrafted birch wood that is 1.5" thick (most every other desktop in the market is either 3/4" or 1" thick), with a 4-ply birch edge. The veneer is now available in a choice of Natural, Black, Cherry, Oak, Rio and Mahogany. Refer to the DZ9500 Desktop Dimensions Chart to see the six different options in desktop shapes and sizes. Unless you have a particular desire to have an extra-thick desktop (no weight bearing statistics are published on the company's website so we can't tell you whether there is any benefit or deficit to this other than the aesthetics) the DZ9500 doesn't seem to have any particular competitive advantages over more reasonably priced options, such as the ThermoDesk Electra. While the DZ9500's desktop options are plentiful, the base width is fixed so placing too large a top on it can create a potential tip-over hazard. The DZ9500 is only sold bundled with the treadmill base, and only the LifeSpan TR1200 is offered for the system price of $2,195. We'd recommend buying the TR1200 from Amazon for $999 (or an iMovR ThermoTread GT if you have a heavy-duty application) and spending less than $1200 on a top-of-the-line desk to go with it, such as the iMovR Lander, Energize or Elite. We're a little troubled that the Signature does not publish weight ratings on any of their desk products. Reputable desk manufacturers always publish this specification. While Signature makes many claims of being the "#1 rated" treadmill desk manufacturer it is rather difficult to find a shred of evidence, or even the identity of who gave them this rating. It certainly wasn't WorkWhileWalking.com, and we're not familiar with any other sites that engage in the review and ratings of all treadmill desk products - we're still pretty much the only kid on the block. In fact, we've sifted through thousands of uploaded photos of people's treadmill desks on Pinterest, OfficeWalkers, Twitter and numerous other social media sites and can tell you that Signature treadmill desks as hard to spot in the wild as a New Zealand kakapo. We see many LifeSpan, iMovR, Steelcase, Rebel Desk and TreadDesk users but have only found some sales pitchy Youtube videos of Signature treadmill desks, probably filmed by their own people. We have discovered numerous discount outlets that appear to carry a mix of Signature inventory, some with model numbers we couldn’t find on the manufacturer’s website (perhaps discontinued), and some possibly used or “open box.” These include Overstock.com, Rakuten.com, O.biz, SaferWholesaleSite and eBay. We'd caution readers to stay clear of these products as they have questionable warranty coverage and would be a huge hassle to return or repair if anything goes wrong with them. There is also another site that the Signature family appears to own, none other than treadmilldesk.com, which seems to feature a mishmash of Signature's above-mentioned products and LifeSpan products. The site claims to be "the worldwide leader in treadmill desk sales," ahem. Pages like FAQ and Shipping were blank when we last checked, and an Alexa ranking of about 14 million (meaning there are 14 million more-visited websites out there) seem to challenge the claim that this is the #1 site in the world for anything, much less treadmill desks. The domain name is registered to the same address as the Signature plant in Fort Wayne, Indiana. What a shame to waste such a nice domain name on such an incredulous marketing front. We were unable to surface any independent user reviews other than the aforementioned hyped-up YouTube videos out there that appear to have been created by Signature or its resellers. The company does not offer its products through Amazon so there are no independent user reviews that we were able to find. The reviews on Signature's websites appear to be staged or at the very least curated, with no negative comments to be found. It seems unlikely than any product of this nature can be absolutely perfect, so take these reviews with a shaker of salt. See our treadmill desk comparison review for our take on the top products in the market. We purchased a Signature Sit2Stand Treadmill Desk in November of 2012. It has a five-year warranty and will now raise up only 3″. I called the salesman and explained the situation. He told me how to “reset” the controls and said if that doesn’t work to call him back. I called him back within five minutes and he didn’t answer. I’ve called him every day now for a week and he doesn’t answer. Does anyone know how to get warranty service on the Signature products?